Take backworking to a new level with WhizAdjust and enjoy the flexibility. This is an innovative and patented toolholder system that is perfect for turning against the sub spindle. The height adjustment goes quick and easy - without loss of stability. Fine-tune your way into the future of backworking, with the patented toolholdersystem WhizAdjust. It is a brand new and adjustable toolholder system from WhizCut - with quick height adjustment and no loss of stability. The quick: The fine-tune adjustment screw together with stable clamping makes it possible to modify center height. Loosen one clamping screw from the WhizAdjust head and shank - and the adjustment can be done. It is as easy as that. The stable: The shank and adjustable head are positioned together with serrated surfaces in X- axis and the adjustment screw plus a spring in Y. The repeatability, by releasing the toolholder and fastening it again, is under 0,005mm. - Quick release and easy to adjust: You only need one clamp screw and one adjustment screw. - Rigid toolholder: with slanted and serrated connection surfaces. 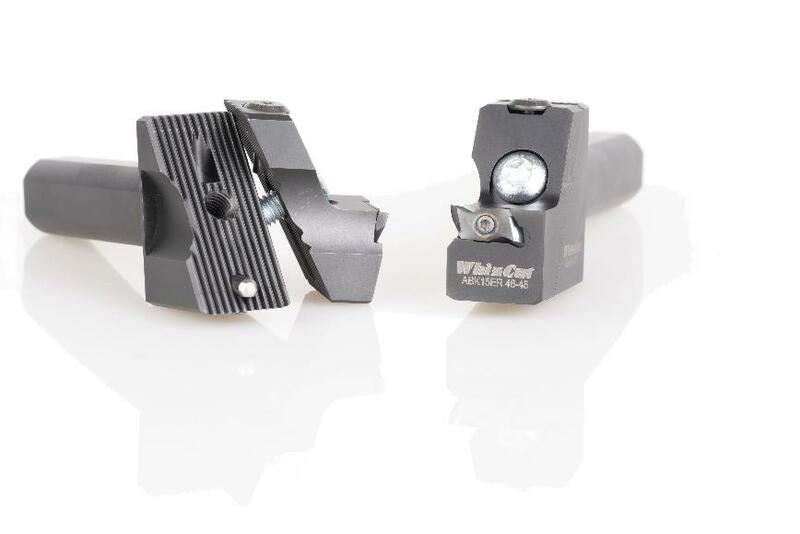 - Combine adjustable heads: use the same shank part for multiple adjustable heads: WhizCut, WhizThread and WhizGroove. - Precise adjustment: +/- 0,02 per line. Fine tuning and repeatability down to 0,005mm.